The 4th speaking event of the Kitchener-Waterloo Peoples Summit (KWPS) is highlighted by a presentation by author and agent of social change Peter Gelderloos and focuses in the topic of Gelderloos’ book, How Non-Violence Protects the State. The talk was entitled Nonviolence, the War on Terror, and Revolution: the role played first by nonviolence and now by the War on Terror to pacify social conflicts, and how people can recover the power to fight back. 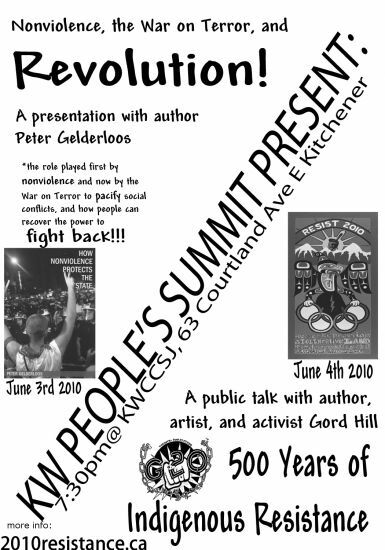 This June 4th 2010 presentation at the KW Community Centre for Social Justice, looks at how the practice of nonviolence and civic mentality prevalent in the antiglobalization and antiwar movements helped pacify social struggles and paved the way for the intensification of the domestic War on Terror. Also explored are how terrorism is replacing violence as a political category used by the state and media to delegitimize social struggles; and how we need to confront the domestic War on Terror in order to overcome the social isolation it imposes and legitimize direct attacks against the system to broader circles of people. In the lead-up to the June G8/G20 summits, Peter Gelderloos, author of "How Non-Violence Protects the State" and "Anarchy Works", is delivering a public talk at the K-W Community Centre for Social Justice (KWCCSJ). Kitchener-Waterloo and other communities throughout southern Ontario and across the country are gearing up to resist the G8/G20 summits, being hosted in Huntsville and Toronto. In the wake of the Royal Bank interior redesign in Ottawa, diversity of tactics have been at the forefront of mainstream media and are among issues being discussed by social justice organizers. This discussion is at the heart of Gelderloos's books, making this a very timely event. In "How Non-Violence Protects the State", Gelderloos examines the emphasis within social justice movements that reserves spaces only for pacifism, limiting the space for any other ideas to be considered and articulated. The mainstream media and some within the social justice movement hold that only pacifist resistance will change the hearts and minds of the uncaring rulers, and divide protestors in either “good” or “bad” sides, based on tactics. Gelderloos debunks these myths and then builds the arguments necessary to effectively confront the global capitalist system. Despite over three years of explicitly peaceful direct action, AW@L has been consistently harassed by law enforcement officials, most notably CSIS, whose activities included house visits, threats, phone calls, and following activists across Turtle Island to Vancouver for the Olympics resistance movement. Recently, such harassment has increased as CSIS has been intruding at the work places, homes, porches, streets, and community centres of peaceful people as they mobilise for the upcoming G20 convergence. As part of the two month-long KW People’s Summit hosted by the KWCCSJ, this talk will give a much-needed explanation of and framework through which to understand these pressing issues.